Kahoot.it is the latest tool in my virtual box of tricks. This is a fantastic way to engage absolutely every student in the class at one time. It is an open source, super charged student response system. You can design multiple choice, true false, or open ended questions for students to respond to on their own device or computer. What makes this especially useful during a live video class is the fact that student can not see the question unless they look the teacher’s screen. The only thing the see are their choices for responding to the question. This prompts them to listen and look up before responding on their own device when they look down. With a lot of online tools my kids stare at their screens and forget to interact with everyone. Like other systems, it scores the responses and displays instant feedback to the students. But here is the bonus fun, it scores them according to who answered the correct question first. Then it displays the leader board with the top 5 scores after each question. At the end of the game you can print a report. You get a formative check of how well your students are doing on the questions posed. My students play anonymously and we don’t spend a lot of time logging in and remembering passwords. You can also search a bank of public quizzes to duplicate and use as your own.This a free tool with no hook them into a premium account plot. 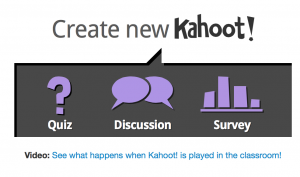 Since the first week I introduced this to my class, I have had at least one request a week to play Kahoot, “Can we play Kahoot today?